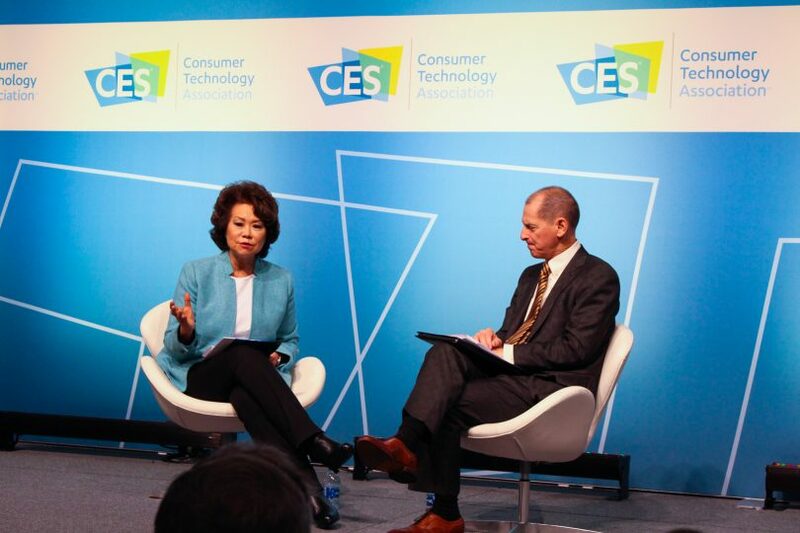 LAS VEGAS — Secretary of Transportation Elaine Chao and Consumer Technology Association CEO and president Gary Shapiro met on the CES stage Wednesday to discuss the challenges and benefits of integrating driverless vehicles and drones into today’s infrastructure. At the conference “A Conversation on Transportation in the US,” Chao said that safety is of utmost importance. 94% of car accidents result from human error, she said, therefore self-driving cars could contribute to decreasing the number of incidents. 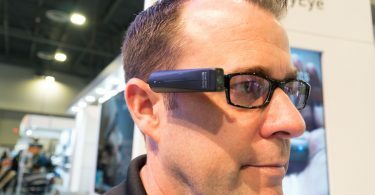 Chao also said the new technology would offer freedom and flexibility for the disabled and aging communities. The biggest drawback of self-driving cars is not the technology itself, but rather public opinion, according to Chao. 71% of drivers are not comfortable with the safety and security that driverless technology offers according to a poll by the National Safety Council. “Their unease will form the limitations as to what this industry can do and also what the potential benefits of this technology can yield,” Chao said. As former Secretary of Labor under George W. Bush, Chao said she also considered the social cost of driverless cars. Shapiro and Chao agreed that these technologies would not necessarily get rid of jobs, but rather create different types of jobs. However, they said, it is up to the industry to make sure workers are trained for the new skill sets that will be required. 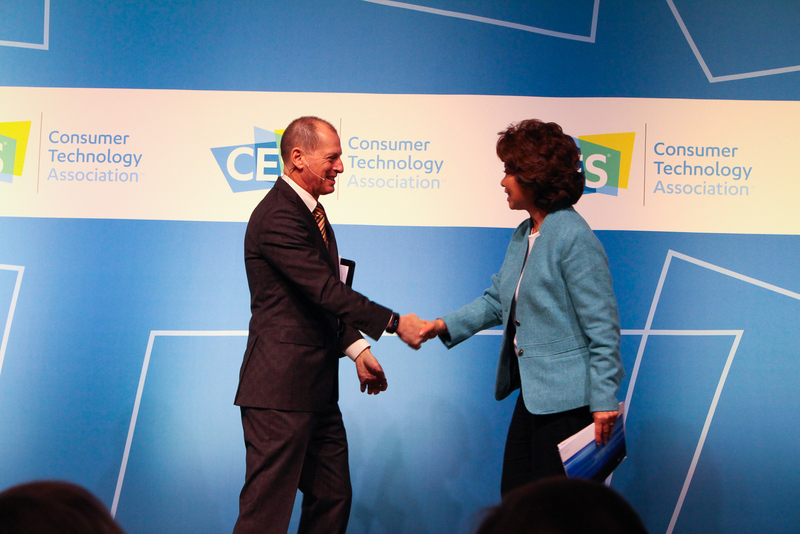 Chao and Shapiro shake hands at CES 2018’s conference “A Conversation on Transportation in the US”. (Claire Tran/BUNS). By the end of CES, the 1 millionth drone registration will most likely have happened, Chao said. Though the industry has created new jobs and services with drone technology, safety and privacy concerns make full integration of drones difficult, says Chao. The Federal Aviation Administration, law enforcement and the general public all hold differing views on the rights of drone operators, leaving local legislatures to balance the opinions of various stakeholders when writing policy. The Department of Transportation organized a pilot program on drones last October to gather the input of ten drone operators on potential legislation. Last September, the department also published a new policy framework called “A Vision for Safety 2.0,” which draws the best practices and ideas to local policymakers when developing guidelines for these emerging technologies, like self-driving cars or drones. Chao said the patchwork of inconsistent and often conflicting state policy is confusing. She said she hopes that every state in the country will take the publication’s advice into consideration. 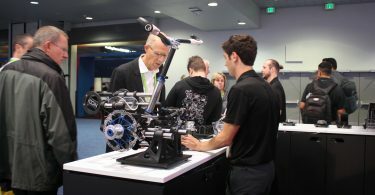 As of 8:45 a.m. Wednesday, the Department of Transportation also released a new public comments section on automated vehicle technology with the ultimate goal of reducing the number of regulations that hamper the growth of the industry. The Department of Transportation has plans to release an infrastructure bill around the State of the Union address, on Jan. 30, which will incentivize the emerging technology industry to be self-sustainable. Shapiro said he appreciated Chao’s efforts to integrate and support new technology.